Is it any surprise now that the dems hold majority in the House they would go after law-abiding Americans gun rights? 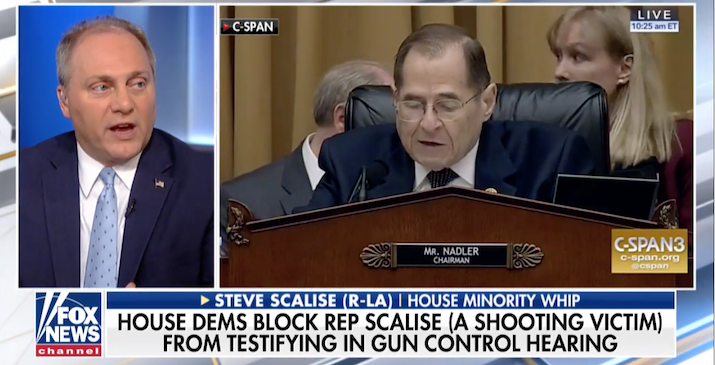 Today they held a hearing on gun control with discussion on a bill that was introduced, HR 8, where Rep Steve Scalise, who being a shooting victim is an expert, was blocked from giving testimony! Scalise is 100% correct, this is what dems do when they are in power, they silence dissent. This proposed bill would do NOTHING to stop any of the past mass shootings or the ones that have yet to happen! Take note as Scalise explains in one scenario their bill would make it a crime to loan your shotgun to a friend during a hunting trip, resulting in jail time and a $100K fine! This bill is nothing more than another level of control as dems slowly and subtly chip away at the Second Amendment. They want to disarm Americans because they know they cannot fulfill their messiah’s dream of fundamental transformation as long as YOU are armed. They are hell-bent on turning the US into a socialized nation where they are running everything. This is what happens when republican voters sit home on election day, YOU open the door for democrats to take power as we saw Nov 2018. They’re not even a full month in power and look what they’re doing already. A fight is coming, this site has pointed out the countless red flags. Those of you in the know, buy more ammo. For those of you finally waking up buy guns and ammo, prepare for the worst hope for the best.